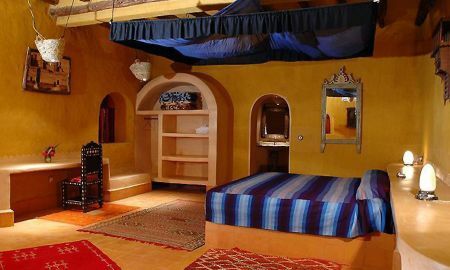 Spacious room with air-conditioning , bathroom in tadelakt with shower. Spacious Suite with air-conditioning , bathroom in tadelakt with shower. A bivouac of comfortable Berber tents is put up for extra-mural accommodation. There is also the possibility of camel rides, to go contemplate both sunrise and sunset or simply to explore the desert. City slickers will be transported far away from the stress of urban life and closed space. 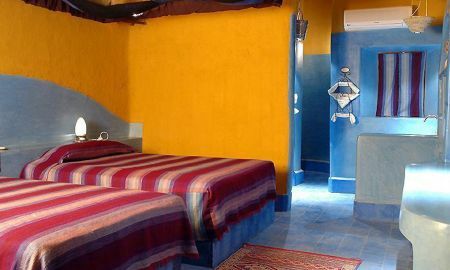 Tombouctou hostel is located in Merzouga, in the heart of a palm oasis. Directions: Pass through Erfoud Rissani (paved road) - Direction Merzouga - Follow indications to the hostel (3 kms before Merzouga village).